I love dogs! Anytime they are in a movie they bring something special! Without Toto in the original movie it would have lacked a special element. He kept everyone on their toes; Dorothy, her mean neighbor, the Wicked Witch and the Wizard for sure! He also kept the movie from being too scary. You cheered for him when he escaped the bicycle’s basket, when he pulled open the Wizard’s curtain and when he ran away from the wicked witches grip. What does Toto bring to the movie version for you? Do you remember any of his other movies? Have you visited his memorial? 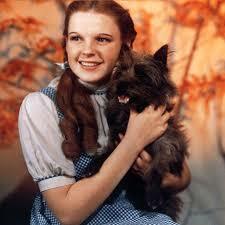 Toto belongs to Dorothy Gale, the heroine of the first and many subsequent books. In the first book, he never spoke, although other animals, native to Oz, did. In subsequent books, other animals gained the ability to speak upon reaching Oz or similar lands, but Toto remained speechless. In Tik-Tok of Oz, continuity is restored: Toto reveals that he is able to talk, just like other animals in the land of Oz, and simply chooses not to. In The Lost Princess of Oz, he talks a blue streak. Other major appearances include The Road to Oz, The Emerald City of Oz, Grampa in Oz and The Magical Mimics in Oz, in which he is the first to recognize the Mimics. In The Wonderful Wizard of Oz, Baum did not specifically state Toto’s breed, but describes him as “a little black dog (male although he was played by a female dog in the 1939 MGM movie) with long silky hair and small black eyes that twinkled merrily on either side of his funny, wee nose”. 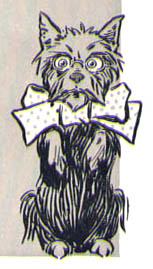 However, from the illustrations in the first book many have concluded that he is a Cairn Terrier while others believe he is a Yorkshire Terrier as this breed was very popular at the time and it fits the illustration quite well. In subsequent books he becomes a Boston Terrier for reasons that are never explained, but then resumes the earlier look in later books. Terry, born in the midst of the Great Depression, was trained and owned by Carl Spitz. Her first film appearance was in Ready For Love which was released on November 30, 1934 roughly one month before her first major film appearance, with Shirley Temple, in 1934’s Bright Eyes as Rags. Terry, who did her own stunts, almost lost her life during the filming of The Wizard of Oz when one of the Winkie guards accidentally stepped on her, breaking her foot. She spent two weeks recuperating at Judy Garland‘s residence, and Garland developed a close attachment to her. Garland wanted to adopt her, but Spitz refused. Terry’s salary, $125 per week, was more than that of many human actors in the film, and also more than many working Americans at the time. 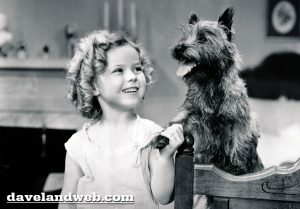 She attended the premiere of The Wizard of Oz at Grauman’s Chinese Theater; because of the popularity of the film, her name was changed to Toto in 1942. Terry had 16 total film appearances, three of which were playing in theaters at the same time in the fall of 1939: The Wizard of Oz, The Women and Bad Little Angel. Her last film was Tortilla Flat (1942), in which she was reunited with Oz director Victor Fleming and Frank Morgan, who played the Wizard. 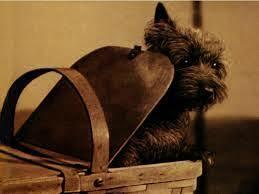 In the 1939 movie The Wizard of Oz, Toto was played by a female brindle Cairn Terrier whose real name was Terry. She was paid a $125 salary each week, which was far more than many of the human actors (the Singer Midgets who played the Munchkins reportedly received $50 to $100 a week). During production, Terry’s foot was broken when one of the Winkie guards accidentally stepped on it. A second dog had to be used while she healed. Due to the popularity of the movie, and because that role was the one she was most remembered for, her owner and trainer changed her official name to Toto. She actually appeared in 13 films. She died at age 11. Willard Carroll wrote her “autobiography,” I, Toto (2001). When she died in 1945 Carl Spitz buried her on his ranch in Studio City, CA. However, the construction of the Ventura Freeway in 1958 destroyed her grave. On June 18, 2011 a permanent memorial for Terry was dedicated at the Hollywood Forever Cemetery in Los Angeles. Terry died at age 11 in Hollywood on September 1, 1945, and was buried at Spitz’s ranch in Studio City, Los Angeles. The grave was destroyed during the construction of the Ventura Freeway in 1958. On June 18, 2011, a permanent memorial for Terry was dedicated at the Hollywood Forever Cemetery in Los Angeles, California. 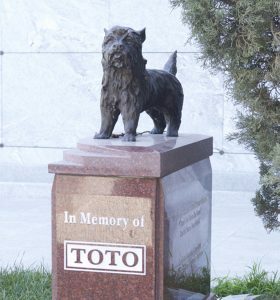 You can still pay tribute to Terry / Toto at Hollywood Forever Cemetery, where her cenotaph can be found on the west side of the Cathedral Mausoleum, not too far from the crypt of one of her former co-stars, Mickey Rooney.